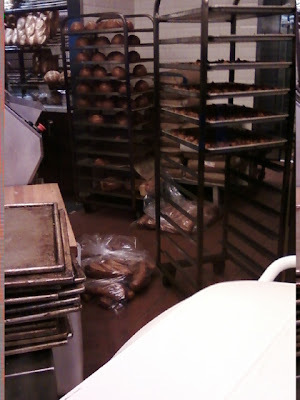 Earning-My-Cape: "Would You Like Your Bread From The Floor, Sir?" "Would You Like Your Bread From The Floor, Sir?" This past weekend, we took our younger four kids out to the Fountains at Roseville. It's a neat little shopping center with a big fountain, train rides, a playground, and some quaint little stores and restaurants. After playing in the playground and tossing pennies for wishes in the fountain, my 7 year old wanted to go to Boudin Bakery Cafe for some sourdough bread. She LOVES sourdough bread! We all do. In fact, we have our oldest son go over to Boudin's at least a couple of times a week to buy fresh sourdough loaves from them. So, we headed over there to buy a baguette. I was completely FLOORED (no pun intended... ok, maybe a little intended...) by what happened next. 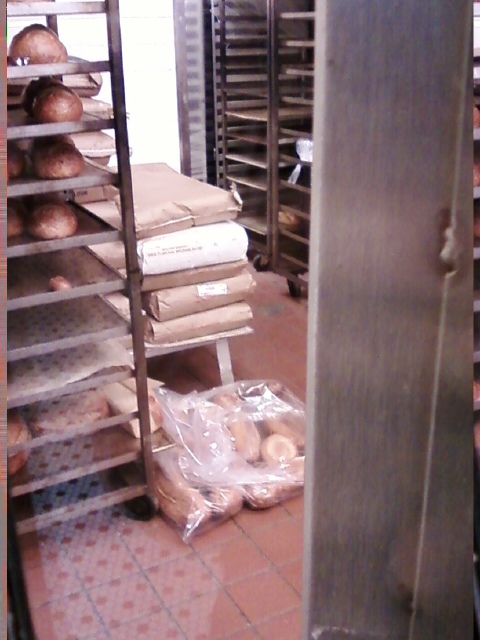 There was one baguette left in the bread container on the fixture next to where the customer line is formed. My husband asked the girl behind the counter if that was the last one, or if they had some fresher bread in the back, as Boudin Bakery is usually known for their fresh bread. The girl glances over... and down. She says that she has one more baguette in the back, and she can get that one for him, as she had just finished bagging it up. She was going to sell us some bread that she had put in a bag on the floor. When my husband asked her if that's the bread she was going to sell us, she just responded by saying, rather aloofly, "Well, it's in a bag." OK. It is in a bag. But the bag could have a tiny rip or hole in it that she may have overlooked. And dirt and bacteria from the floor could get through that hole. It is unsanitary and I am sure there has to be some sort of health code against it. Oh, and, it's on the FLOOR! The girl didn't seem to understand why it was not a good idea to have bread on the floor. Her manager walks over to join in the conversation, and she sees no problem with it either. She tells us that they are not selling that bread, so it is ok for it to be on the floor. Um... excuse me... the other girl was just trying to sell it to us! When we told the manager this, she just brushed it off, as if it didn't even happen. 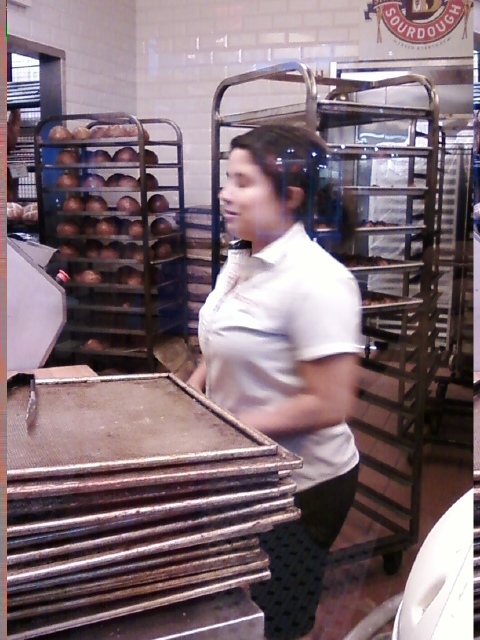 She reiterated that they do not sell this floor bread... they donate it. Seriously??? This makes it ok? I asked her, "So, if you donate it, then aren't people still eating it? How is that ok?" By this time, she wasn't making any sense at all. She tells me that most of it probably doesn't even get eaten anyway, they don't sell it, and it is donated, so it's ok for it to be on the floor. Her main point of her argument was that they don't actually sell that floor bread (even though they were just about to sell it to us) so, it doesn't get eaten. Instead, they donate it. Is it just me, or is something seriously wrong here? Are the people who go to the food closet or soup kitchen that receive this bread lesser humans than she, thus making it ok to give them floor bread??? Is this Boudin Bakery's policy? Needless to say, this upset me. A LOT. Enough for me to dedicate a post to the incident. 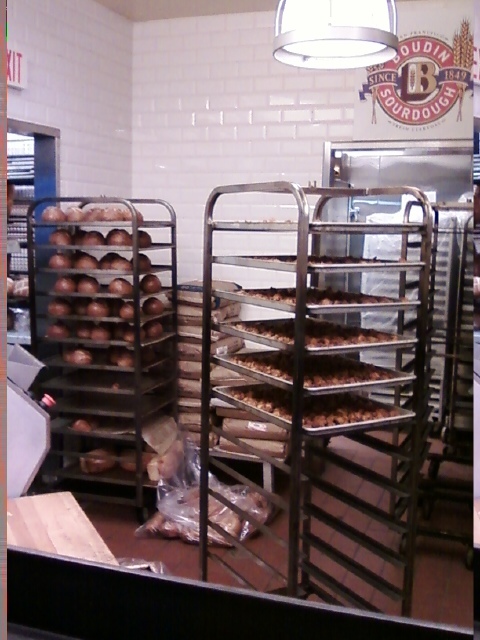 Enough for me to contact the Boudin Bakery corporate office. Enough for me to get the word out any way that I can. Do people really have that attitude? That is just wrong! Before we leave, I snapped a few more pictures to send to the corporate office. The manager says to us that she is sorry that we were there to see the bread on the floor. NOT that she is sorry the bread was on the floor, and it shouldn't be there, and she will make sure it doesn't happen in the future... Just that she is sorry that we saw it. 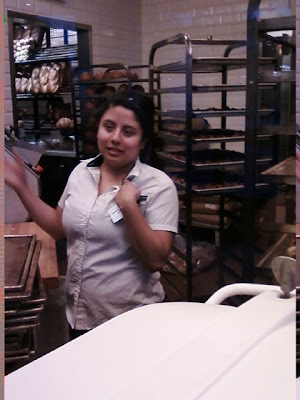 Boudin Bakery, if you read this post, I would love to hear your thoughts on this. and didn't want her name tag in the picture. Oh look... TWO bags of bread on the floor! Had to get the Boudin Logo in the picture. We ended up going over to Whole Foods and buying some yummy sourdough there, along with some smoked mozzarella cheese. Delicious! It is safe to say that we will NOT be buying our sourdough from Boudin Bakery again. *All photos are uploaded from my cell phone camera, and they are unedited. Susie Q! You had one of my bad food experiences! Wow!! Sarah, I was thinking the SAME thing!!! Crazy bread experience! That is definitely not an okay thing to sell bread on the floor. I wonder what the health department would think of that? We tried to tell the manager there that it was probably a health code violation, but she didn't even care. We were even trying to be discreet about it, but she started to cause a scene. And in the end, she shoo'd us and our kids out the door, telling us to leave... that really made others look on. I have heard back from Boudin's PR person, and she basically said she is making sure the right people know about it and they are going to bring it up with the staff. The donated bread go to cows to be put in there grain for 1. For 2 that plastic bag is not a small Walmart bag it's a thick endustial bag I'm sure bread is not going to tear it or put a hole in it. Plus iv never seen bread on the floor they must have been closed and sounds like they where nice enought to let you in.. & know u are knocking this pour girls just tryen to do her job!! Gross! I was going to take my mom to lunch there on Sunday. There is no way I'm taking her there now. Even if the bags are thick, like the previous comment says, it is still on the floor and they were going to sell it to you. Yuck! The manager just sounds rude too. I'm not going to pay good money for bad service and unsanitary conditions. Thank you for this post! Anonymous, for one, the girl there tried to sell some of this bread to my husband and I. For two, not once did the manager say that the bread was being donated for animal feed. In fact, when I commented to her about the people who were getting the bread, she just shrugged it off and never mentioned that it was for animals. And for three, I never said that the bags were small Walmart bags. It is clear in the pictures that they are not, and I never tried to elude otherwise. They ARE plastic bags. They ARE full of bread. They ARE on the floor and the girl there DID try to sell it to us. And lastly, perhaps we did go in to the restaurant near closing time... I am not exactly sure what time it was, BUT the doors were open and there were other guests dining inside. We were not told that they were closed, and the girl at the counter was perfectly willing to take our order... which was simply a baguette to go. I am in no way knocking a "poor girl trying to do her job". Everything I said was factual. This "poor girl" was unprofessional and, in my opinion, not fit to manage a restaurant. I know for a fact I would not let her run mine. We discreetly pointed out an obvious health hazard, and in return we were treated rudely and the manager made a scene by throwing us and our three small girls out of the restaurant. She treated us like WE were the ones doing something wrong. This "poor girl" obviously needs more training if she pans to be a successful restaurant manager, and she should work on her people skills if she wishes to work with the public. Kate, I'm sorry I "ruined" your plans. I hope you and your mom have a nice lunch on Sunday!